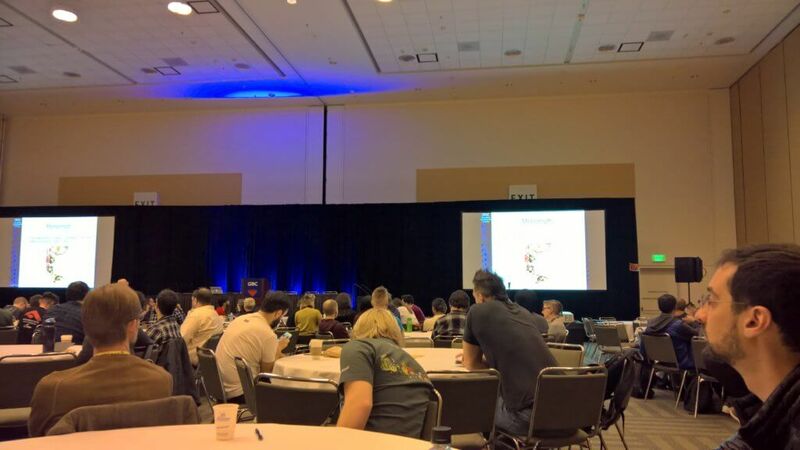 Finishing my first year as a full-time indie, participating in Train Jam 2019, attending my first GDC, connecting with other community organizers from around the world and starting a new project. GDC was huge, I never seen so many game developers in one place before! It was both exhilarating and overwhelming at the same time. The trip was very exhausting, especially coming in from across the world (20hrs going, 25hrs coming back x.x) but was very much worth it. I don’t see the value of going every year even if I could afford to, but I would certainly benefit from attending at least every 2-3 years. While there, I took the Storytelling Fundamentals in A Day workshop by ex-telltale narrative designer Evan Skolnick which left me feeling confident in writing stories for my own games. I’m obviously no expert, but the level of knowledge presented in this 1-day workshop is so far above anything we have access to here in Bahrain I decided to “redo” the workshop for my local community. I won’t be as good as the real deal but it would still be better than what we currently have (which is close to nothing). Other than talks and workshops, I’ve attended the Community Organizers roundtable and met other organizers that would like to learn from and share with each other tips and tricks into managing our local communities. I’ve also met a few indies that would like to collaborate in the future. 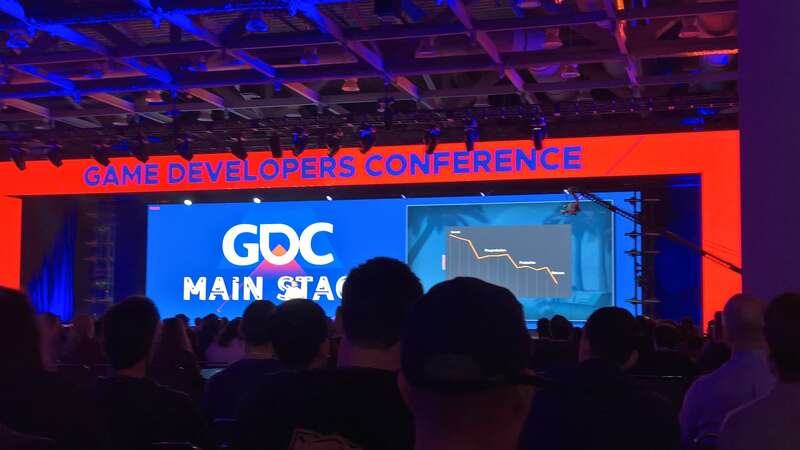 So, from the list of 5 things I wished to accomplish in GDC19, I managed to achieve 3 of them, not too shabby but not all I hoped for either. However, I can get in contact with publishers online and I have a person in mind that would be awesome as a mentor, I’ll get in touch with him and hopefully will take me in. There’s quite a bit I wish to do and currently in the process of reevaluating my plan of action, so I don’t have a “next step” just yet. This ends this month’s report, hope you enjoyed and if you have any feedback please comment below 🙂 . Monthly Reflection #12 – Getting Ready! Scheduling GDC & setting up meetings, redefining my brand and dealing with a health issue. I’ve postponed further work on Against Sahara this month as I get ready for GDC. Network with other indies and start dialog for collaboration between Bahraini indies and indies from other nations. Determine publisher interests in our region and establish connections with indie-friendly publishers. 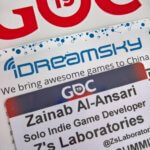 Level up my game dev skills through hands-on workshops at GDC. (Potentially) find a mentor that can help me grow faster and steer me in the right direction. Network with other community organizers, especially from emerging markets that share our struggles, to start collaborating and sharing knowledge on what works and what doesn’t to help each other build our local game industries. I have been in contact with several people to meet up there, and also planning to attend a couple of round tables to meet indies from developing countries. Chose sky blue and dark grey as the main brand colors, with orange as an accent color. These colors meant to give the image of freedom, trust, practicality and creativity. Along with the recoloring, I redesigned my business cards to better represent what I do. Something that people seem to do at GDC is write notes on people’s business card about who they were and what they talked about to remember them (since they’ll be meeting hundreds there!) which drove me to make a simple back without clutter and the sky blue color instead of dark grey so they can write on it. I haven’t been able to do much the past month while going back and forth to the doctor’s with a problem in my left ear, but thank God it’s healing and is due course to (hopefully) be cured before my trip. What’s Next: Train Jamming & GDC! Next week is my trip-of-a-lifetime and will be my whole focus to take advantage of it as much as possible. I will document the events with as much detail as possible to help those who couldn’t go to benefit as well. Follow me on Instagram @ZsLaboratories to watch my stories of the events!. 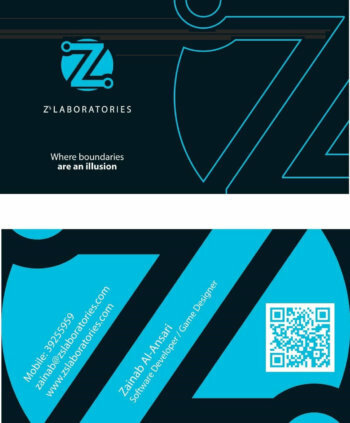 Looking for publishers, getting ready for US trip, restructuring Z’s Laboratories and making a GGJ game. I’ve been researching board game publication options, and I am leaning towards self-publishing the game instead of signing up with a publisher. I wouldn’t even recoup my living expenses with that kind of numbers, let alone hope to build a business around that!. However, I still wish to sign up with a publisher if I can get one. I am seriously considering becoming a tabletop publisher myself for Bahraini game designers, as that will help speed up the rise of the local industry, and I’ll learn much faster by working with an established publisher on a game first. Although, most publishers I found want casual party or family games, so I might design a simple one and pitch that instead while leaving Against Sahara to self-publish. Got everything ready for the trip ahead, from bookings to flights to scheduling my GDC trip. If you’ve been reading my blog for awhile you might’ve noticed some stuff disappearing or moving. I’ve been contemplating a lot on what I really want to do with Z’s Laboratories, and made the current changes to reflect on my decision to specialize into solo game dev. This means that any article or advice I post will assume my reader is another solo dev, and any learning materials I create will be for someone who needs to learn it all from scratch, although I would be naturally more into the programming side of things as I’m first and foremost an engineer. I had originally planned to skip the GGJ this year, but I’m too much of a jammaholic and couldn’t help myself 😆. You can check out my GGJ19 game by clicking here. 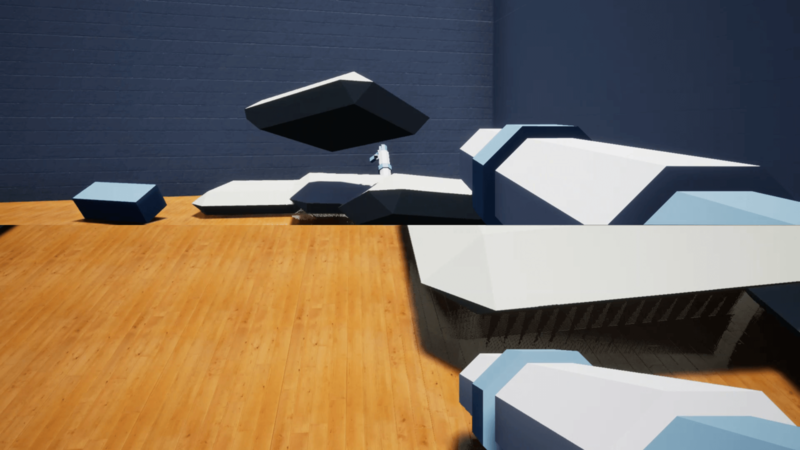 I’m looking to get an experienced game designer and a strong UE4 programmer as mentors. The hope is to learn much faster than I currently am, and they can help steer me in the right direction without me having to look for my way in the dark. Studying, researching, getting US VISA and organizing local game devs 6th anniversary meetup. I decided to turn Against Sahara into a physical tabletop card game instead of digital, and now preparing a clean prototype to pitch to a tabletop games publisher. 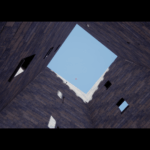 I’ve been reading indie game postmortems while focusing on first timers, to avoid their mistakes, and completed the UE4 udemy course How To Develop Your First Two Games, which I highly recommend for anyone starting out UE4. After going thru the hell that is the US VISA application, my visa was thankfully approved. So, it’s final, if God wills I’m heading off to USA next March and participating in Train Jam and GDC 2019!. To commemorate 6 years of community, I decided to do a 6th year special event where we celebrate where we’ve come, and reflect on how we’re currently doing to improve going forward. Agenda included: cake, 6 years of photos and videos and a discussion of problems to solve for next year. I ran a survey prior to the meetup asking for feedback about the community, you can read the summary results here by clicking here. Now that I’ve learned all I can from others at this point; and feel confident about my current skill sets; going forward I will be focusing entirely on Against Sahara and getting it published. One advice that successful indies keep repeating is to get published, at least for our first couple of games. The idea is when we’re first starting our fan base is non-existent, which makes having a commercial success extremely difficult to achieve. Other than helping us stand out, a good publisher would also teach us the ropes and help us up our game. Just be careful of which publisher to partner with, and do your research about them. This November I took time off to prepare for the Bahrain Game Jam 2018, simplified my schedule, tapped into my investments to refocus on learning UE4 and applied for Train Jam 2019’s diversity program. I’m writing this reflection a bit late because of the game jam ending on 1st of December, and the subsequent chaos that I needed to clear up first. Didn’t work on the game this month, and have decided to postpone development for awhile and fully focus on simply learning UE4. I needed to do this move sooner but what stopped me is my lack of cash savings which would’ve lasted me a couple more months at most. But since then, I decided to cash in my stocks and bonds. This will cover another year of living expenses, and allow me to focus on improving my UE4 skills and wait on releasing a game just yet. I have spent this past month mostly reworking my UE4 workflow and upgrading my UE4 development skills. The difference showed in my Bahrain Game Jam 2018 (BGJ18)’s entry, where if you compare to my previous solo jam entries the upgrade in production values is quite clear. I’ve decided to let go of “gym day”, and instead start the week every Sunday by studying the business side of things and doing research, while the rest of the week to be spent on whatever project am working on, whether a learning project or a commercial game. Instead, I’m now doing shorter, more-intense bursts of exercise throughout the day, everyday and don’t count it towards my work schedule. A couple of weeks ago I saw the application for Train Jam’s diversity program just 2 hours before deadline, and signed up straight away. The team behind the initiative have accepted me into the program, am going to Chicago and San Francisco on March 2019 if God wills it. Two of the most difficult aspects of game development in Bahrain and in the region in general, is the severe lack of quality education and access to experienced devs and game publishers or game investors. Participating in Train Jam as well as attending the Game Developer’s Conference will give me access to all of these!. 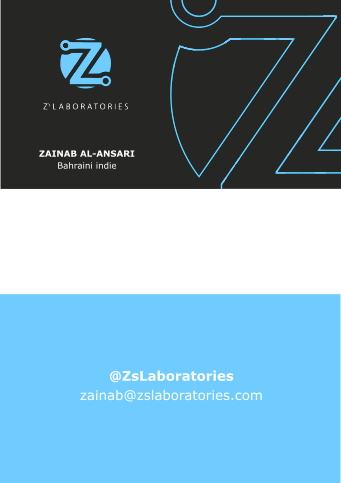 Needless to say I’m very excited, and grateful for the opportunity as the game developers community in Bahrain has been trying, and unfortunately failing, to kick-start an industry here and go beyond hobby projects for 6 years and counting, but this might finally be the catalyst towards a real industry here (hopefully). I’m working on a small 3rd person survival game and plan on working on it throughout December, while going back to Against Sahara afterwards.